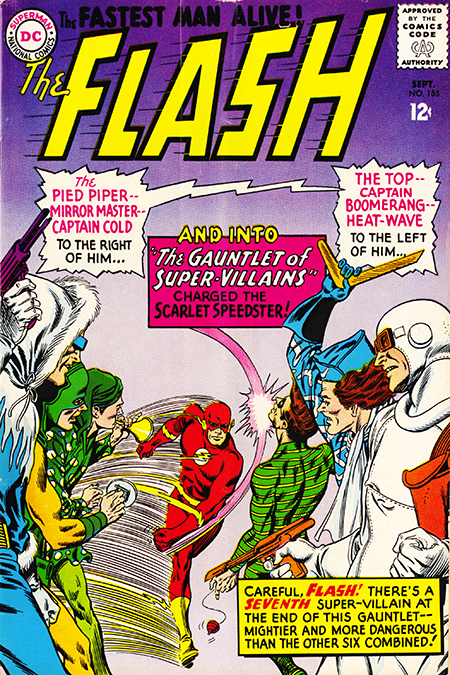 At first, the thought of the Flash battling all of his super villain foes at once seems like a thrilling idea, which is no doubt why Julie Schwartz came up with it for the cover of this issue. But these team-ups (of baddies or goodies) always bothered me because, upon further reflection, it turns out that there are a number of things not so thrilling about the idea. First, suspending our suspension of disbelief for a moment, the Flash is obviously going to defeat all of these rogues or there won’t be a Flash magazine the next month. So, with that as a given, where do you go from here? By toppling all of his baddies at the same time, it seems to diminish the import of the Flash’s battle with any individual foe in the future. How can you build any suspense in say a future battle with Captain Cold, when a half dozen villains banded together couldn’t do the job? Which leaves you with the only other option which is to ratchet up the numbers in a villainous arms race to an artistic Armageddon. That being said, the story opens with the Mirror Master suddenly out of prison having switched places with a citizen of Central City. Still in his prison uni he heads to a taylor named Leach, who has taken the place of Paul Gambi the taylor to the rouges gallery, to have him whip up a new Mirror Master for him. There he discovers that the same mysterious thing has happened to five other Flash foes. They decide to gang up on the Flash who, after escaping their death trap, discovers a strange radiation present where the villains had been. It eventually leads him to the city zoo where we find that Grodd the Super Gorilla is the mastermind behind everything. This is a nice touch and reinforces my feeling as noted previously that Grodd always seemed to fit the job description of being the arch villain in the Flash saga. Grodd has switched minds with a gorilla in the Central City zoo which the Flash discovers after another trip to Gorilla City. Grodd actually defeats the Flash only to be pummeled into submission by a female gorilla who thinks Grodd is her old boyfriend (she’s partially right, it’s the body of her old boyfriend anyway). Once the action has shifted to Grodd and Gorilla city, the other Flash villains become afterthoughts as the aforementioned is a pretty hard act to follow. Which circles back to the point I was making at the top. By banding the rogues together, their individual uniqueness is diluted, and you’re left with having to find some new way to make them relevant again. The problem continues to be endemic in today’s comics where mega-world shattering-someone important will die crossovers forever (I know… forever? In a comic book? Don’t make me laugh.) foreclose on many options the writers might have been able to utilize going forward. All of which can then lead to some pretty ugly retcons. The bottom line in all of this is that, if you’re going to bring the house, you’d better have some sort of plan in mind for what happens after that.